I was going to try out a new apple recipe (it’s harvest season, right?) until I went to the supermarket and stopped to chat with my favorite fish seller. As I joke I asked, “What? No octopus?” (Not that I’ve ever seen octopus in that store.) She replied, “No, but follow me,” and pointed to a new line they’ve just started carrying, which included frozen squid. The obvious choice for cooking it is to fry it, which is about as simple as it gets: cut the tubular bodies into rings, dredge all the pieces in flour and fine crumbs, fry until golden in hot oil, add salt and serve. I’m sure most of us have had those in a restaurant or pub somewhere, and they do taste good. 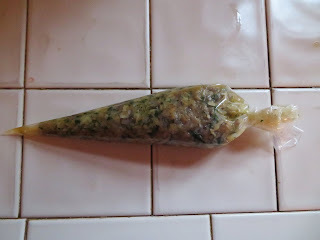 But I wanted a “real” meal, not just tasty munchies, so I started hunting and found that Maida Heater had an interesting recipe in her 1973 cookbook, The Classic Italian Cookbook, which I’ve had a copy of for years (love her blender pesto recipe!). 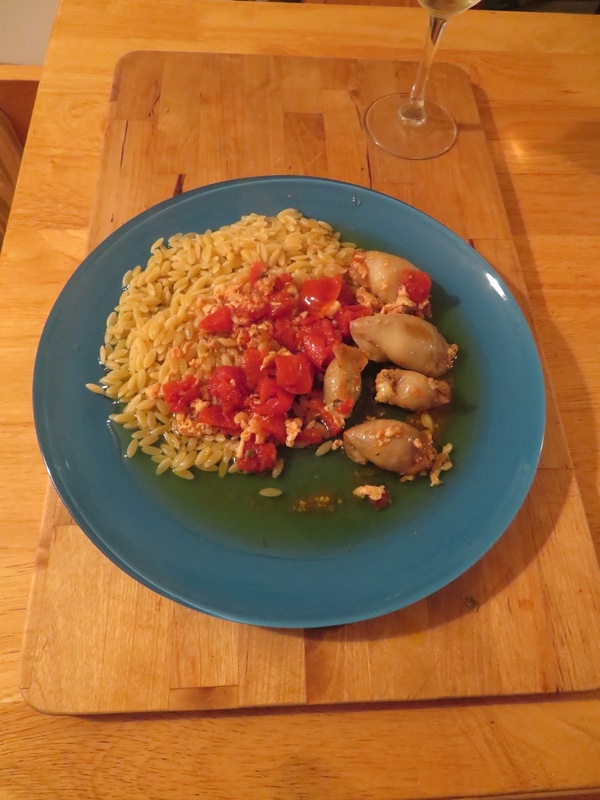 Her stuffed squid recipe is simple in terms of flavor, with plenty of garlic. Some of the steps kind of mystify me (do I really have to sew the squid bodies shut so the stuffing won’t fall out?) so I came up with a few variations of my own. Mince the tentacles (how often do I get to say that?). 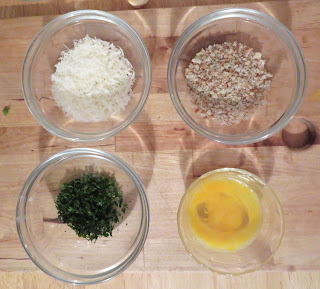 Mix together all the stuffing ingredients and blend until fairly smooth. 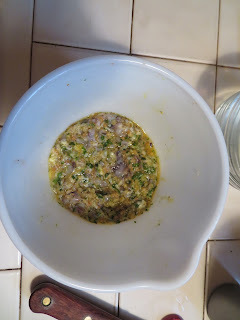 Add enough olive oil to make the mixture shiny (and not too dry). Then Maida said that we were supposed to secure the open end of each squid by sewing it closed with a darning needle—I vetoed that. Instead I closed the open end with a wooden toothpick. Okay, the stuffing leaked out of some of them, but I wasn’t about to perform surgery on all the little critters. 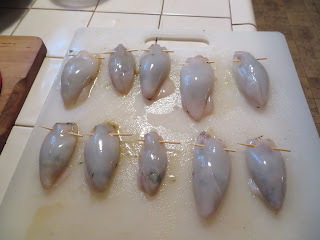 One note: the squids shrink when you cook them, so do not overstuff! In a skillet large enough to hold the stuffed squid in a single layer, add enough olive oil to coat the bottom well and heat over medium-high heat. 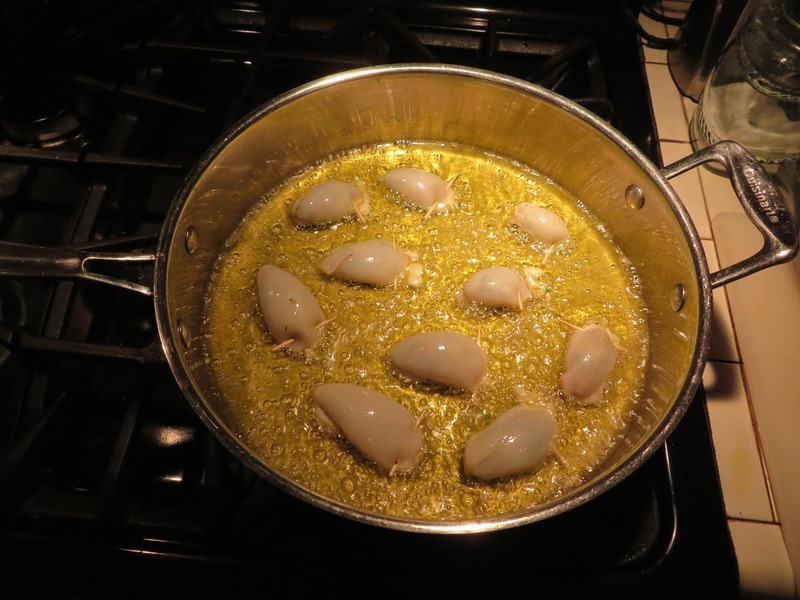 Add the whole garlic cloves and sauté until they are golden, then discard them and add the stuffed squid to the pan. Brown the squid on all sides, then add the chopped tomatoes and their juice, the chopped garlic, and the wine. 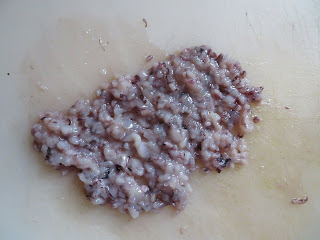 Stir, then cover tightly and cook over low heat for 30-40 minutes (or less, if your squid are small, which mine were). They should be tender when poked with a fork. 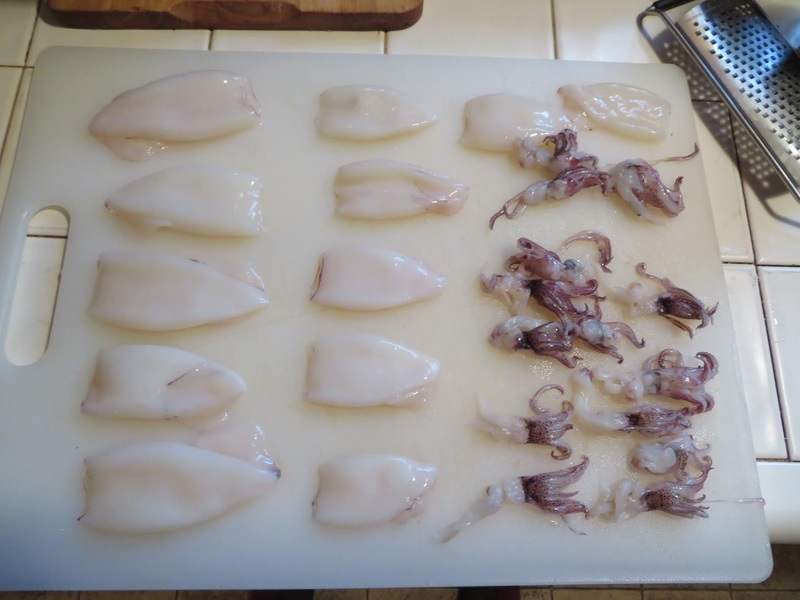 Remove the cooked squid to a cutting board and let them rest for a few minutes. Remove the toothpicks (don’t forget! 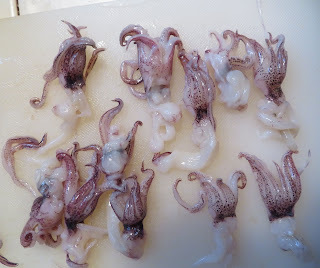 ), then Maida said to cut the squid bodies into half-inch slices. Mine were tiny after cooking, so I left them whole. Arrange on a platter or individual plates. 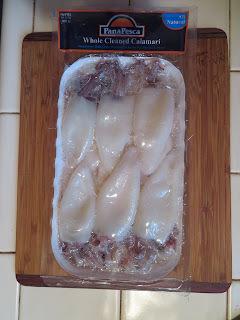 Warm up the sauce in the skillet and pour it over the sliced squid. Serve immediately. 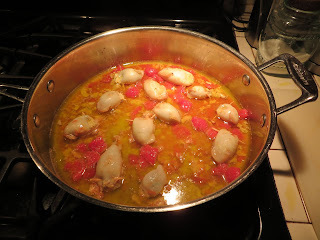 For some reason that escapes me, Maida suggested serving these with steamed potatoes. Seems an odd choice to me. Rice or pasta would work well, and I chose orzo. If I could find larger squid, I’d go with them. As it was, the results were a bit messy, but they definitely tasted good. I'm still up for trying to cook octopus, if I ever find any. Small update: the 12th Orchard Mystery now has a name: Nipped in the Bud! It will be released in print format by Beyond the Page Press at the end of October. Any day now we will have a cover for it! 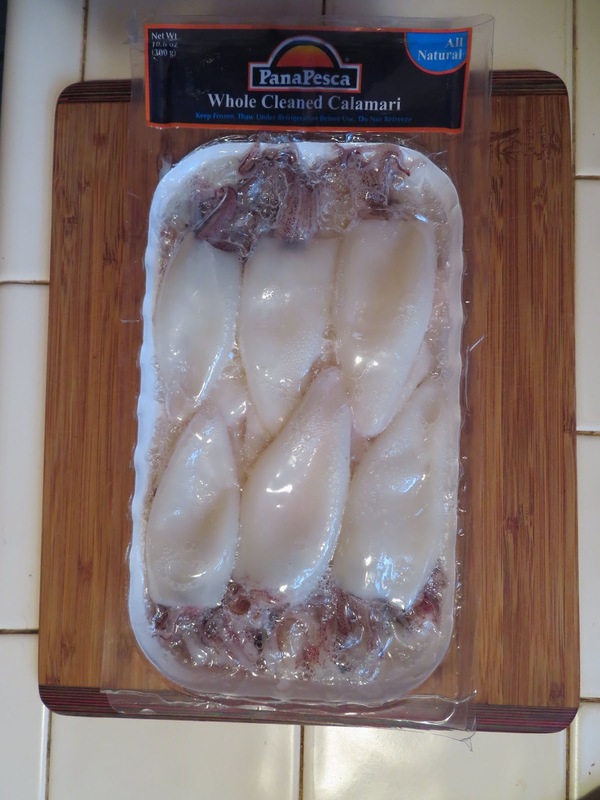 I haven't had stuffed squid in ages. My mother used to fix this often when I was young and at home. Lately, I have it as a salad. It's really good. 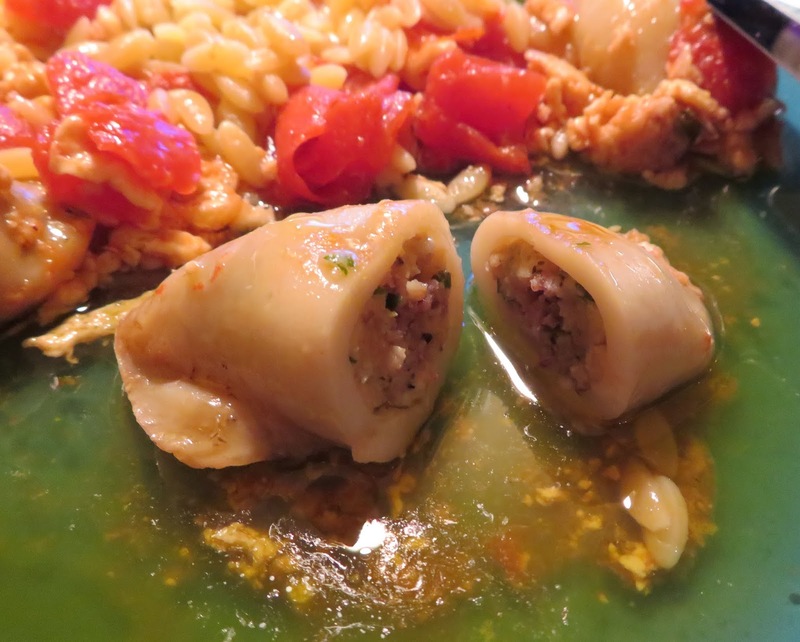 These tasted really nice--fresh and flavorful, despite being frozen (and traveling a few thousand miles). I may try them again. I would not make these but I liked your instructions. Interesting read. Nice you enjoyed. I doubt I'd make it often, but it was interesting. I got a laugh at the idea of suturing the critters shut. You are a marvelously adventurous cook! A question on the instructions. 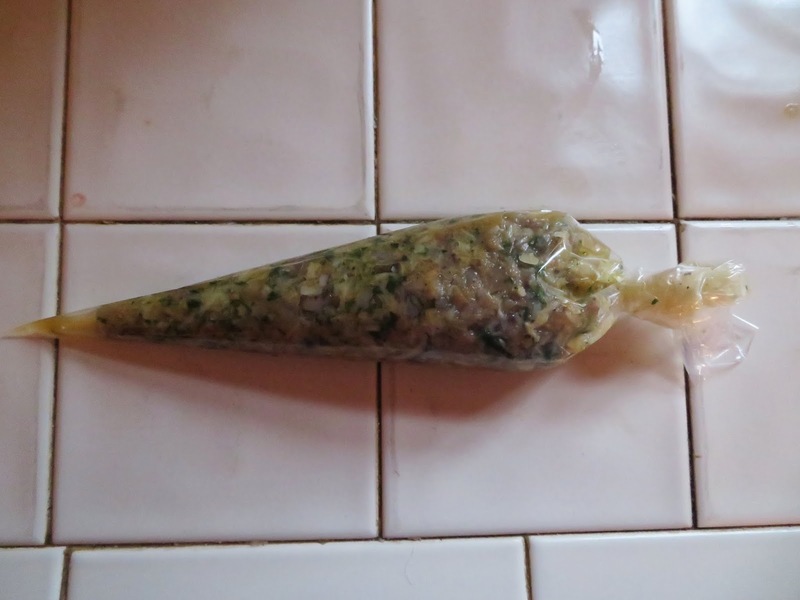 Am I right that the minced tentacles are added to the stuffing mixture? Yes. I did a double-take when I saw that (and the tentacles are a challenge to chop--it takes a sharp knife) but the flavor is good. I love stuffed squid in a garlicky tomato sauce. Haven't had that in years but a friend used to make it.